The ocean circulation that is responsible for England's mild climate appears to be slowing down. The shift is not sudden or dramatic, as in the 2004 sci-fi movie "The Day After Tomorrow," but it is a real effect that has consequences for the climates of eastern North America and Western Europe. Also unlike in that movie, and in theories of long-term climate change, these recent trends are not connected with the melting of the Arctic sea ice and buildup of freshwater near the North Pole. Instead, they seem to be connected to shifts at the southern end of the planet, according to a recent University of Washington study in the journal Geophysical Research Letters. "It doesn't work like in the movie, of course," said Kathryn Kelly, an oceanographer at the UW's Applied Physics Laboratory. "The slowdown is actually happening very gradually, but it seems to be happening like predicted: It does seem to be spinning down." The study looked at data from satellites and ocean sensors off Miami that have tracked what's known as the Atlantic overturning circulation for more than a decade. Together they show a definite slowdown since 2004, confirming a trend suspected before then from spottier data. Looking at other observations to determine the cause, the researchers ruled out what had been the prime suspect until now: that massive melting and freshening in the North Atlantic could stop water from sinking and put the brakes on the overturning circulation, which moves warmer water north along the ocean's surface and sends cold water southward at depths. "It appears that this 10-year slowdown is not related to salinity," Kelly said. In fact, despite more ice melt, surface water in the Arctic is getting saltier and therefore denser, she said, because of less precipitation. "That means the slowdown could not possibly be due to salinity — it's just backwards. The North Atlantic has actually been getting saltier." Instead, the authors saw a surprising connection with a current around the southern tip of South Africa. In what's known as the Agulhas Current, warm Indian Ocean water flows south along the African coast and around the continent's tip toward the Atlantic, but then makes a sharp turn back to join the stormy southern circumpolar current. Warm water that escapes into the Atlantic around the cape of South Africa is known as the Agulhas Leakage. The new research shows the amount of leakage changes with the quantity of heat transported northward by the overturning circulation. "We've found that the two are connected, but I don't think we've found that one causes the other," Kelly said. "It's more likely that whatever changed the Agulhas changed the whole system." She believes atmospheric changes may be affecting both currents simultaneously. "Most people have thought this current should be driven by a salinity change, but maybe it's the [Southern Ocean] winds," Kelly said. The finding could have implications for northern European and eastern U.S. climates, and for understanding how the world's oceans carry heat from the tropics toward the poles. "I think it changes how we think about the whole Atlantic overturning circulation, of which the Gulf Stream is a part," said co-author LuAnne Thompson, a UW professor of oceanography. "It brings back the role of the atmosphere into what's controlling the climate in the high latitudes, that it's not all driven by what's happening in the oceans." 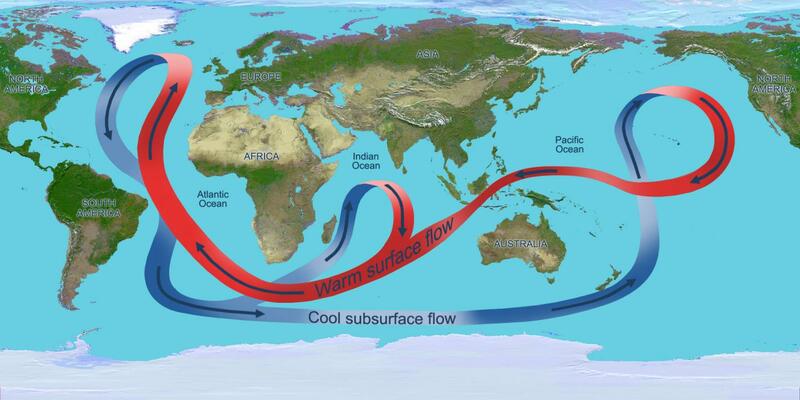 And while a slowdown of the Gulf Stream and broader overturning circulation, for whatever reason, would bring less warm water to eastern North America and Western Europe, any effects are overwhelmed by the overall warming due to global climate change. "So that whole concept in the movie of New York harbor freezing doesn't make any sense," Kelly said. "If the Gulf Stream doesn't carry as much heat from the tropics, it just means that the North Atlantic is not going to warm up as fast as the rest of the ocean — it's not going to cool down." The study was funded by NASA and the U.K.'s Natural Environment Research Council. Other co-authors are Kyla Drushka at the UW Applied Physics Laboratory, Dewi Le Bars at the Royal Netherlands Meteorological Institute and Elaine McDonagh at the U.K.'s University of Southampton. For more information, contact Kelly at [email protected] or 206-543-9810 and Thompson at [email protected] or 206-543-9965.